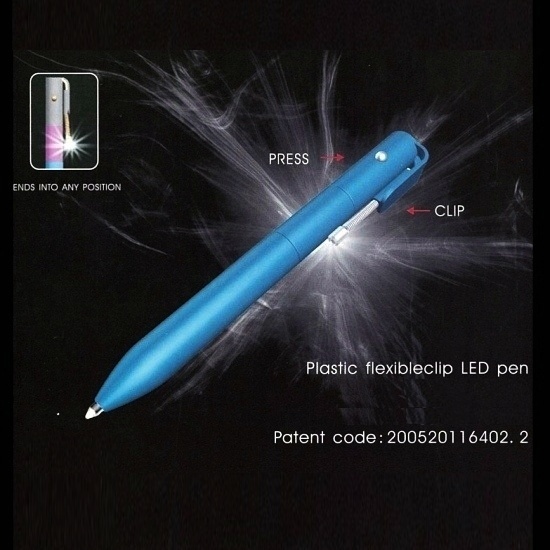 The pen is made of plastic and has a wide barrel for comfortable holding. It has a bendable clip equipped with a LED light and can adjust the light beam to any position. This pen has a button on the side for turning on the light and is excellent for writing and reading in the dark. Wide barrel in solid color. Bendable clip equipped with a LED light. Can adjust the light beam to any position. Button on the side for turning on the light. Excellent for writing and reading in the dark. Available in different barrel colours.